Iddefjorden is a long and narrow fiord separating Norway from Sweden in the south of Norway. On both sides of the fiord there are mountainous areas containing huge amounts of the popular building material granite, used in street pavement, buildings and sculptural work. The first time we hear about the extracting of granite from this area is in 1842. This year there was a fierce fire in the german city of Hamburg. After the fire more than 4000 houses lay in ashes, and there was a desperate need for building material in rebuilding quays, canals and houses. A german by the name Waitz came from Hamburg to Fredrikshald (todays Halden). It is mentioned that he - to cut down the budget costs - engaged slaves and prisoners from the Fredriksten fortress to do the heavy work. The stone was then shipped to Hamburg. Ole Berntsen Sanderød from Telemark was the next one showing interest in the stone quarries along Iddefjorden. In 1872 he bought a huge mountain by the fiord (Skottene-malen), and started the production of paving stone. 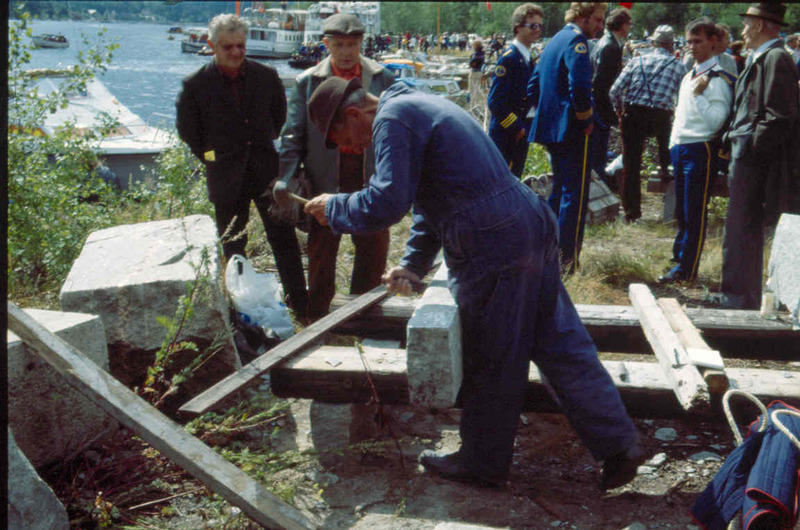 The stone was shipped to Kristiania (todays Oslo) in sailing vessels. In 1872 the management of the company was undertaken by by engineer Thorvald Heiberg, who employed Ole Berntsen Sanderød as foreman. 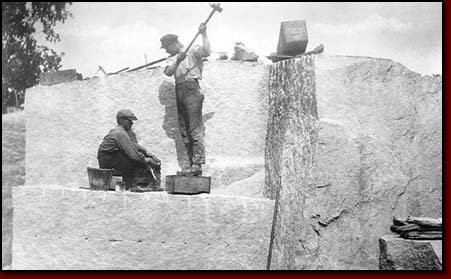 During the 1870s and 1880s the stone industry expanded significantly. A new shareholding company - Halden steinhuggeri - was created as the first exporting-business in the country in this industry. The company was later integrated into De Forenede Stenhuggerier (The United Stonemasonries). 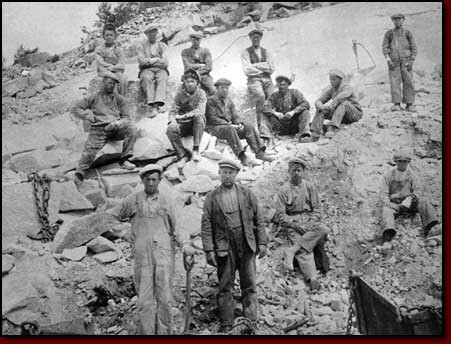 This company kept up the stone production on both sides of the fiord until 1904. In 1904 the norwegian shares were undertaken by the British Norway Granite Co. In 1873 another German by the name Georg Lüttensee had started stoneproduction at Liholt by Iddefjorden. He was later joined by his countryman W. Werner. They run the business on both sides of the fiord up to 1893, when the company was sold to N. S. Beer & Co. 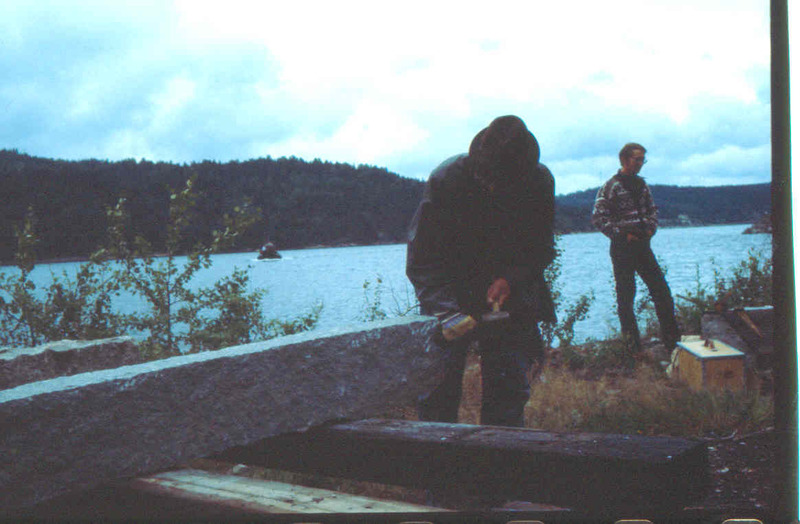 This company developed into the largest stonetrading business along Iddefjorden. 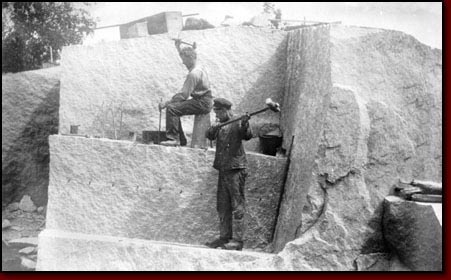 Around 1910 the firm British Norway Granite Co had around 200 workers employed in the stonequarries at Bakke, and at Liholt around 300 workers were employed by Lüttensee. 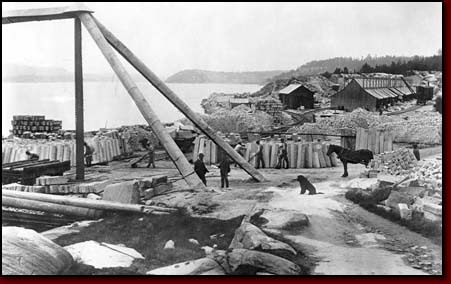 In addition to this, N. S. Beer had workers employed in the stonequarries at Osdalen, Fagerholt and Hov. Among the workers employed at Fagerholt were my Great Grandfather and Grandfather. 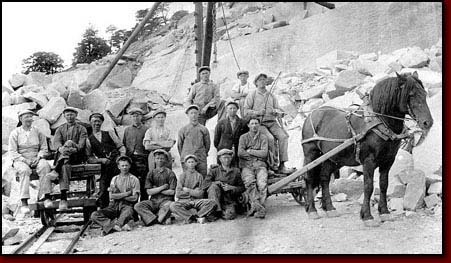 The number of stonemasons steadily increased, and in 1914 there were approximately 2000 of them working in the quarries by Iddefjorden. The major part of the stone was exported to Great Britain, but the stone was also shipped all over the world - to distant places like Latin-America and South Africa. 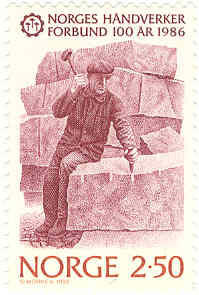 During The First World War the production of stone along Iddefjorden stagnated, and the stone-masons were forced to seek work elsewhere. 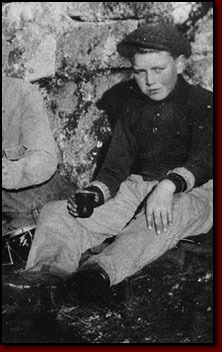 In 1915 - the year my father was born - my grandfather moved with his family to Greåker (a place close to Sarpsborg), to work in the stonequarries there. 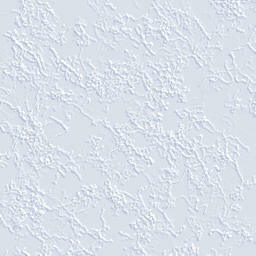 Here he settled with his wif and two small children in a small white cottage in the Greåker mountains. The production here lasted until the mid 1930s. 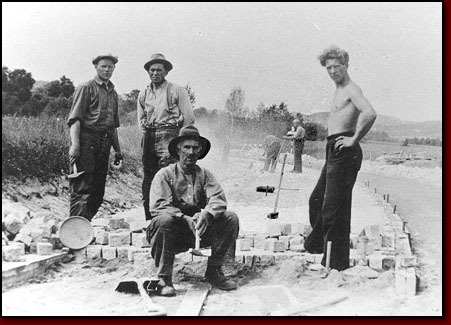 In the 1930s unemployment and relief work dominated the scene. Stonepaving of the old road in Idd was among the relief enterprises. My granduncle Ferdinand and his two sons Harry and Henning were among those engaged in this work. Unfortunately this beautiful stoneroad is today coverded with asphalt. And it was exactly the increasing utilizition of asphalt that became the deathsentence for the once so blooming stone industry. Efficiency had won - estehtics and craftmanship had lost. The stone was also utilized in gravememorials monuments and sculptures. 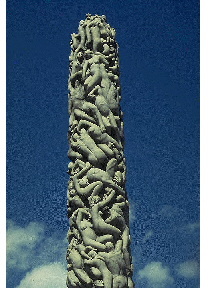 The most famous sculpture carved in stone from Nokkedalen by Iddefjorden is The Monolite in the Vigeland park in Oslo. 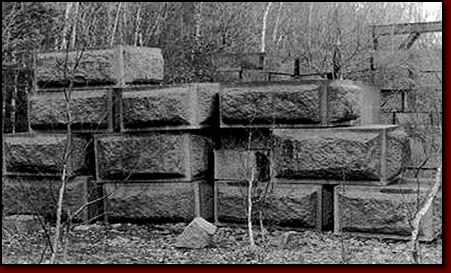 The huge stoneblock was shipped to Kristiania (Oslo) in 1926. 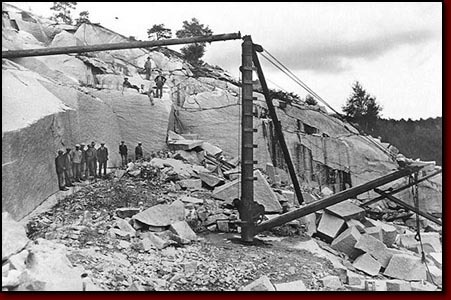 During the second world war the Germans showed a renewed interest in the stone quarries along Iddefjorden, and a part of Hitler's gigantomanic plans for the rebuilding of the New Germany was supposed to find its realization by the use of stone material from Iddefjorden. 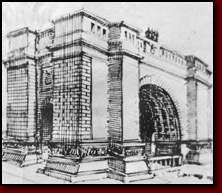 Hitler's chief architect Albert Speer managed to effect some orders for the building of a gigantic triumphal arch in Berlin before the war ended. Remnants of this work can still be seen at different places along the fiord. Today Fagerholt Monumenthoggeri is the only preserved stonemasonry by Iddefjorden. The place was founded by N. S. Beer in 1938, and production here continued up to the mid 1990s. The site contains a carving shed, Norway's first stonewire saw, remnants of a workshop for letter-making, a crane, a messroom and a compressor house. The compressor house is made from so called "Hitler stone". The raw materials were collected from stonequarries in the vicinity, or imported. The final years the carving of tombstones was the main business. Fagerholt Monumenthoggeri was reopened as a museum in august 2000. Another important reason for the stagnation and drastic decline in the stoneindustry, was the steadilly growing competition from abroad. Stone was imported from countries with cheap labourpower in the third world - like China and India. The large square in front of the City Hall in Oslo was paved with stone from these countries. In 1995 12 000 squaremetres were paved with 40 000 handcarved slabs of granite rock from India. Stonemasons around the turn of the century - from a young boy's view. (By Arthur J. Berby, b.1892 in Idd). My father was a stonemason. I startet school in 1899. Already during my first school holiday, my father had found me a job as a shepherd-boy at a small cottage in the woodlands. After some scary experiences, I ran away the next day. My father then decided I should come with him to “the mountain” (The stonemasonry). When I think back today, I can't really imagine how it was possible to treat a child this way. At the time I didn't give it much thought. My four year older brother had already been working at the stonemasonry for some time, just like other boys his age. But I think I was the youngest of them all at the time. Half past five in the morning I reluctantly had to climb out of my straw bed, put on my clothes and my wooden shoes, and then "yawn" a cup of weak coffee into my system, accompanied with a couple of slices of bread with margarine and sugar. At a quarter to six it was off to work. It was a good forty minutes walk to "the mountain". Work usually started at 6.30, but there were really no rules at the time regulating our workinghours. "The mountain" was really a steep hillside (Stenbudalskollen) rising about 200 metres above sealevel. At the top of the quarry it was really windy, and almost no vegetation, so in the winter it was no place of desire. But now it was summertime and really beautiful. When the weather was clear one could sight Iddefjorden the whole way northward, and from east and west one could see for miles. I had plenty of time to watch and listen, because I was still too young to be trusted with any working tools. One of my first chores was collecting twigs for the bonfire required for making coffee, and of course fetching water for the same purpose. So most of the time I was just doing nothing, except of course watching the stonemasons at work. I also had time to wander around in the other quarries. There were not so many of them. This was one of the smaller quarries in the region, employing about 30 workers and some boys like me. 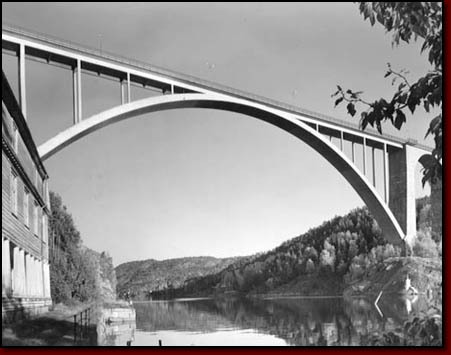 The borderline was close to the quarry, and about half of the workers lived in Norway, the other half in Sweden. Usually the stonemasons worked in pairs. I don't remember any of them ever quarreling. 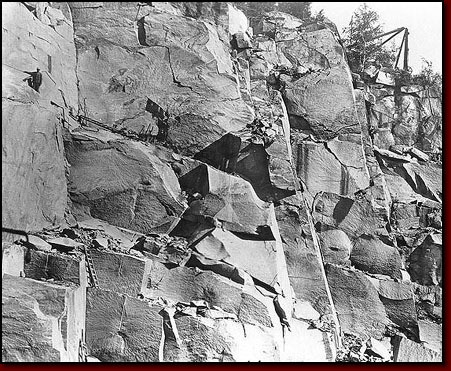 When really huge stoneblocks were to be wedged out of the mountain, this usually was done with gunpowder sprinkled in the wedgeseam. By the sound of the blast people gathered around from nearby quarries. They were not only curious about the result of the explosion. 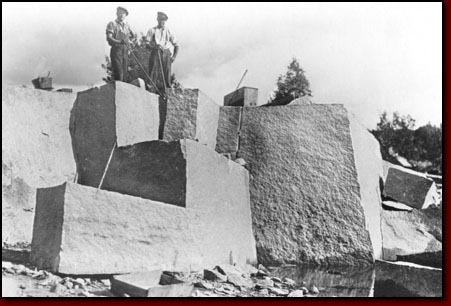 No, they knew that whenever such a huge stoneblock had been wedged out of the mountain, several workers with crowbars were needed to turn it over and prepare it for further wedging. Therefore they always carried their crowbar with them. When I think back today, it puzzles me that theft was almost nonexistent in those days, not only among the stonemasons themselves, but also among people living in the vicinity. wedgingbores and wedges, different kinds of hammers, spiked chisels and flat chisels, spiked and grooved pickaxes and sledges, crowbars and blastingrods. It was also an advantage to have more than one tool of each kind, because then you didn't have to run to the blacksmith every day. The tools were worth a lot more than a stonemason would earn in a month. And never did I see anything being locked away. The tools were spread all over the quarry, and just left lying where they last had been used until the next day. How it all started I never quite seem to remember. My first memory is missing the drill with my hammer and striking my thumb instead so it went completely numb. I bent over in pain trying to hide my thumb so nobody would notice the blunder. Yes, I had really started at ground level in this craftmanship. My first challenge was boring wedgeholes. I started off with the smallest holes needed for the last cleavage before the blank reached the final chopping block. The holes had to be exactly 4 inches deep, but no more than 1\2 inch in diameter, so the drills I used were really small. My hands holding the drill had to circulate all the time to make the hole round. I don't remember getting blisters in my right hand, but I vividly remember the pain from repeatedly striking my left hand. The knuckle on my left thumb was especially vulnerable, it was skinned time after time. The only remedy - and it was really efficient too - was sprinkling stonegravel over the wound. It immediately stopped bleeding and made a nice crust. I just had to shake away my tears and start hammering a little more careful. But I soon forgot being careful - and so my knuckle got bloody once more. Or the fear of hitting my wounded knuckle resulted in missing the drill at the opposite side, giving me two sore knuckles. How long it took before I learnt aiming the drill right, I don't remember. I only know that when I started school again after my vacation, and only could come to “the mountain” every second day, I had become so eager and clever that I could start working for other stonemasons. And that was a lot more fun, because I got paid two pence a hole. Father of course never paid me anything. But he had given me the training making it possible for me to earn money. The work was really not so simple. The stonemason first marked the wedgeseem with a special tool, before he carved a straight chisel line. Then he had to make marks for the drill holes. The holes had to be exactly right centered, and completely round. And that was not always as easy as it might sound. For a novice they could just as well turn out triangular, and that would make it impossible for the drill to blast in a horizontal direction, as it was supposed to. The blanks then came out dented, and caused a lot of extra work. As my practise increased, one record after the other was broken, until I - almost bursting with pride - could tell my family that I had managed to drill 20 holes in a day, and earned the respectable sum of 2 shillings. This happened in the spring after my 9th birthday. 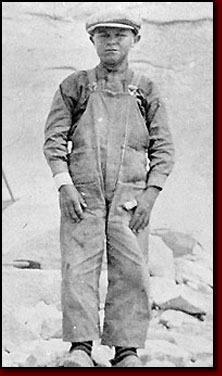 In the spring of 1907, at the age of 14, he resumed work in his father's quarry. Arthur Berby, the author of this essay, was born the same year as my grandfather Alfred (1892). I presume they knew about eachother, perhaps they even attended the same class at school. Anyhow, they must roughly have shared the same experiences in the stonequarries in Iddefjorden around the turn of the century. A nice weekend in August 1979 stonemasondays were arranged on the old festival grounds at Bakke. The arrangement was prepared and put into effect by Halden Historical Collections, in cooperation with Local authorities and Idd-Halden Labour Party. 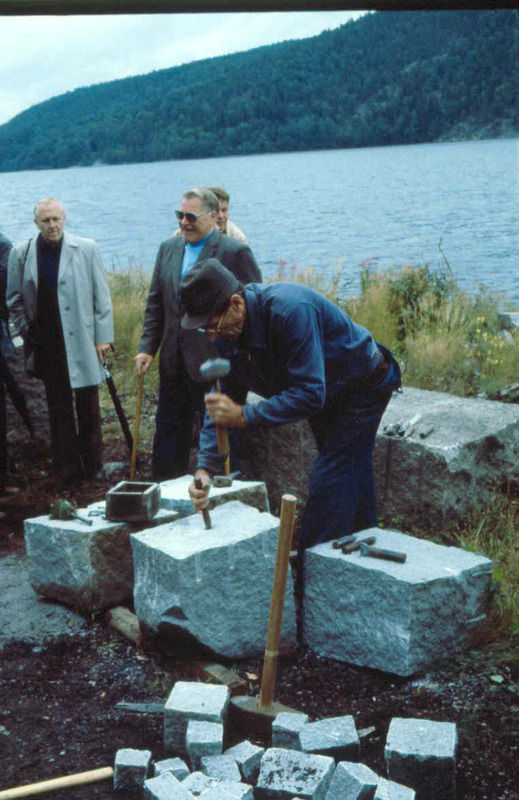 The guest of honour was the former Prime minister Einar Gerhardsen, who held a splendid speech, honouring the old stonemasons and their achievements. The old messbarack had been converted into an exhibition site for the occasion, showing old photographs from the Golden days, drawings, old protocolls and letters, and of course a rich assortment of old tools used in the quarries. Outside in the open the old craftmanship was demonstrated. Many of the old stonemasons proved they hadn't forgotten their old trade. The arrangement was a great success, and people came streaming along from near and far. Old stonemasons were reunited, not having met for a long time, new contacts were established, and old memories revived.